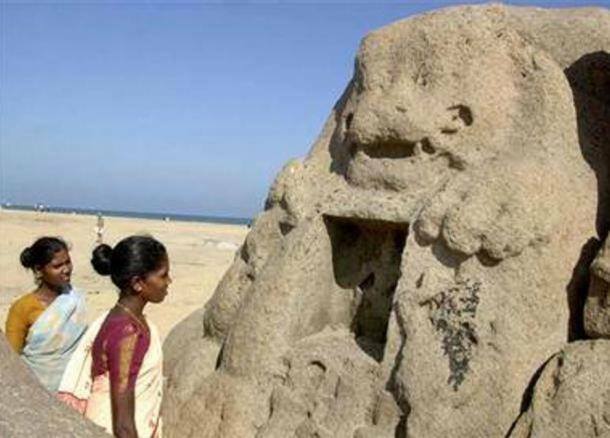 The ruins of a temple were glimpsed during the 2004 Asian Tsunami when the shoreline receded in Mamallapuram (also known as Mahabalipuram), India. More than 10 years later, divers and scientists have confirmed the existence of at least one ancient temple and the possibility of many more constructions off the Indian coast. According to the Times of India, when the shoreline receded during the tsunami, people saw a long row of granite boulders emerge from the sea. Following that event, a group of scientists began their expeditions off Mamallapuram’s coastline. These explorations of the site have provided evidence for the theory of some legendary structures – known as the ‘Seven Pagodas of Mahabalipuram’ in this area. Of the seven temples, only one - the Shore Temple, remains visible on the coast today. However, the divers have confirmed what eyewitnesses saw during the tsunami -the waters cover the vestiges of an ancient port. Underwater explorations of the historic town of Mamallapuram, near Chennai (old Madras), will continue. A group from the National Institute of Oceanography (NIO) found the remains. Until now, the group of the 10-member team, including the geologists, archaeologists, and divers, have found a 10m (32.8 ft) long wall, a short flight of stairs, and chiseled stone blocks scattered on the seabed. The structures were found 800m (2624.7 ft) from the shoreline at a depth of nearly 8.5m (27.9 ft). The expedition was led by Rajiv Nigam, the head of the marine archeology unit of NIO. He told the Times of India that the divers found it difficult to identify many of the structures as they were covered with thick aquatic growth. He also explained to the same source that “Some of them are badly damaged due to strong underwater currents and swells. As for the date of the structures, Nigam said that they believe they are about 1,100-1,500 years old, but ''We also found some brick structures, which were sighted more during the Sangam period (300 BC- 200 AD). The NIO also worked in 2001 in another underwater site, the 9,000-year old town in the Gulf of Cambay (Khambhat) near Gujarat. The remains of a huge lost city were located about 36 meters (120 feet) under the water. The city is 8 km (5 miles) long, and 3.5 km (2 miles) wide. It is believed to be the oldest known remains of a city in the subcontinent. The main tool which helped in discovering the city was a side scan sonar, which sends a beam of sound waves down to the bottom of the ocean. The artifacts discovered underwater, including pottery, sections of walls, beads, sculptures, and human remains, allowed the team to confirm that the city as 9000 or even 9500 years old. With the advances in modern technology and also the increasing number of archaeologists who search for ancient underwater sites, many sunken buildings had been discovered recently. Some of the sites were made only a few decades ago, but they still hold many secrets.